The European Central Bank (ECB) is to almost double the size of its cash reserves, giving it more funds to tackle eurozone financial problems. The ECB is to increase the reserves it holds to 10.8bn euros ($14.3bn; £9.1bn) from 5.8bn euros at present. It is requesting the cash from the 16 national central banks in the eurozone, and it is the first time it has asked them for such a cash injection. 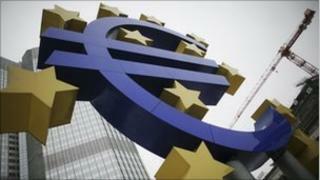 The EU has recently bought billions of euros of eurozone government bonds. It has bought them from some of the eurozone's most indebted countries, such as Greece, Portugal and the Republic of Ireland. It has done so to help limit the rise in the interest rates the governments have to offer to reluctant buyers when they issue their bonds. The ECB said the increase in its funds "was deemed appropriate in view of increased volatility in foreign exchange rates, interest rates and gold prices, as well as credit risk". Analyst Michael Schubert, an economist at Commerzbank, said the ECB was sending a strong message to national governments. "With this, the ECB gives a clear signal that purchasing bonds isn't, so to say, a free lunch, but it creates a lot of risks and therefore it decided to increase the subscribed capital," he added. The ECB's announcement comes as national leaders from across the European Union are discussing the stability of the eurozone economy at a meeting in Brussels.